Posted August 28, 2015 by laurielmorrison & filed under Author Visits, Posts about author visits and Skypes, Teaching. Now that school is about to start up again, I’m reflecting on the author events we did last year and what I learned from new things we tried. We had some exciting virtual and in-person visits, and my main takeaways from our events may be helpful for others, too, so here’s what I came up with. 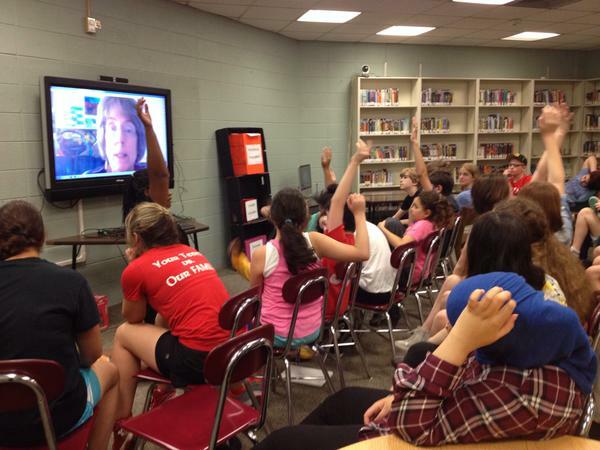 Last year, we were able to virtually visit with two of the authors whose books we had read as a class. After reading Everybody Sees the Ants, the eighth grade Skyped with A.S. King, and after reading Brotherhood, the seventh grade had a Google Hangout with A.B. Westrick. (Google Hangout seemed to work when there were challenges with Skype and provided a nearly identical experience, so if you’ve had Skype issues, that could be something to try.) In addition, different groups of students Skyped with Varian Johnson and Uma Krishnaswami, two authors I would have loved to host in person if they lived closer. I’ve been organizing Skype visits for several years now, and my number 1 takeaway is that it pays to be both prepared and flexible. To prepare, it’s great to have students read something by the author. It’s especially great when the whole class has read one of the author’s books, but if that’s not possible, it also works to share the beginning of a book or even a short story or article by the author; when we talked with Varian Johnson, some but not all of the students had read The Great Greene Heist, but all of them were excited because they all read “Like Me,” his short story from the anthology Open Mic: Riffs on Life Between Cultures in Ten Voices, and “Where are all the black boys?“, a blog post he wrote back in 2013. It’s also helpful to have students brainstorm questions ahead of time. If you’re doing a Skype in an auditorium for a very large number of students, then it’s a good idea to plan out which students will ask which questions in what order. However, that’s not necessary when it’s a smaller group (although I find it’s best if I call on students so that the author doesn’t have to say, “Okay, you in the blue shirt. No, not you, him”). After the students are prepared and the technology is set (it’s always great to have someone around for troubleshooting), it works well when the author knows what he or she will do if students run out of questions. Sometimes, Q and A will fill up the entire allotted time. When eighth graders talked to A.S. King, our time was up before the kids were out of questions. But when a group of students visited with Uma Krishnaswami, Uma offered to read a picture book at the end of the visit, and that was a big hit. If authors are comfortable with the technology, it’s a lot of fun when they have slides or documents to share in order to supplement the Q and A; A.B. Westrick started our Google Hangout with a PowerPoint that included some great photos, and Uma Krishnaswami shared her first edit letter for one of her books. Awesome turnout for upper school lunch visit! At the end of the year, we had the opportunity to host I.W. Gregorio, author of None of the Above. Ilene’s book is most appropriate for high school readers, and she has a very busy schedule. The only day she could come was at the end of May, close enough to final exams that high school teachers weren’t comfortable giving over class time for the visit. So we thought outside the box and planned a lunch time visit. To make sure stressed-out students would come, my colleague Maureen suggested that we provide pizza for students who signed up ahead of time. We also enlisted SAGA (the Sexuality and Gender Alliance) to help us spread the word. In the end, we had a great turnout and were glad we weren’t deterred even though the visit came at such a busy time. In general, it can be more difficult to plan high school visits than middle school ones because high school schedules are harder to interrupt, so I think lunch time visits with local authors can be a great option. 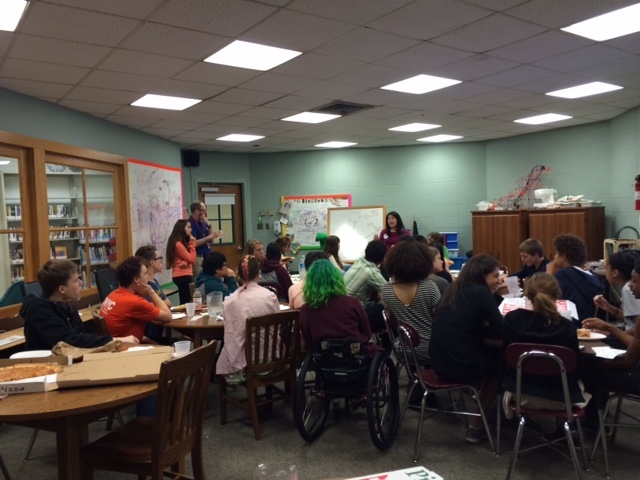 Our biggest event this year was a Local Author Day for the middle school. We hosted three authors–Paul Acampora, Lisa Graff, and Dianne Salerni–and we invited fourth graders, who are entering middle school this fall, to join us. 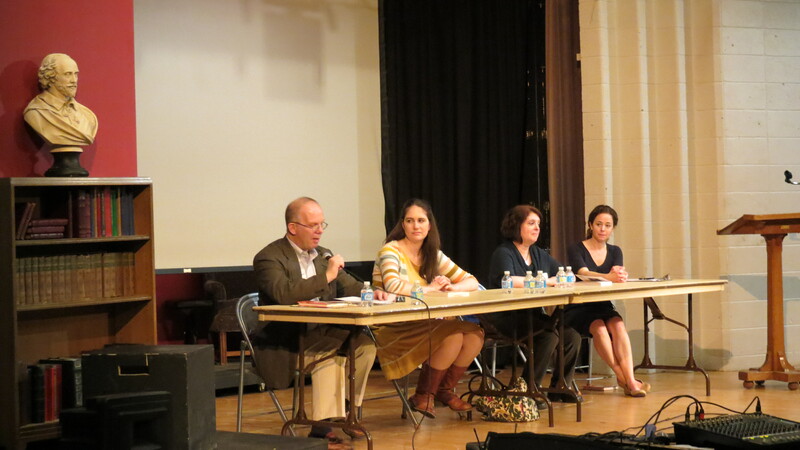 Each of the authors visited with one middle school grade before lunch, and then they all had lunch with the writing and library clubs. After that, they participated in a panel discussion for the whole middle school and fourth grade, and finally, they signed books that students had purchased. All in all, it was a very successful event! The individual presentations were the biggest hit, with the authors offering some writing activities and making connections to each grade’s curriculum. Lunch and the panel were also great opportunities for students to hear from all three authors, and we sold a whole lot of books! We organize author visits in part to get kids excited about reading, and since each author had more than one MG book, there was something to appeal to almost every reader. When a single author comes to visit, we tend to order their books from their publisher, because the publisher can usually offer a great discount. But for three authors with many different publishers, we partnered with a local bookstore. The bookstore provided books for us at a small discount, and we sold as many as we could and returned the books we were unable to sell. A few of the books sold out, and we had the authors sign bookplates and then ordered additional copies from the bookstore. It went very well to partner with the local bookstore and have so many books available (seven choices total). We also shared this Local Author Day Book Order Form with both students and parents ahead of time, so many students ordered books ahead of time. If you are hosting authors for a visit (or if you are an author visiting schools), I would highly recommend supplying some kind of pre-order form. However, a lot of students still wanted to buy books at the event, which was great, except that it got chaotic to make change for them and give other students the books they had already paid for so that they could wait in line to have them signed. Next time we do an event like this, I might want to have one station set up where someone has all of the unsold books and a cash box to make change, and then another station closer to the authors, with all of the pre-sold books to hand out. All in all, we were able to connect students with some terrific, inspiring authors, and I’m looking forward to building on last year’s author events and making use of these takeaways! I hope they are helpful to others, as well. Wow. Your events sound very well organized, Laurie. Do your students ever suggest authors they’d like to visit? How fun to see Anne on screen. 🙂 I’ve done events with Google Hangout. Sometimes there were glitches though. Thanks so much! Students definitely suggest authors…but they’re usually people like John Green, who are a little bit outside our budget! One girl who just finished 8th grade really wanted Rebecca Stead to come back when she was in 6th grade and we were never able to make that happen, but my colleague and friend Maureen got a signed ARC of Rebecca’s new book personalized to the student at the end of last year, which was pretty awesome!! Laurie, It was a really fun visit, and I was happy to be a part of it! I was surprised to hear the students wanted MORE read-aloud from us in the panel, because I was worried that would be the boring part for them — that they’d want to hurry up and get to the questions. Since I was the third person to read, I actually cut what I’d been planning to read in half, worried that their eyes would glaze over. But they were such a great group of kids! And I still laugh over the girl at the signing who pointed out my Doctor Who backpack propped up against a wall and said, “Is that yours?” And when I said yes, she just held out her arms for a big hug. LOL!